Summer menus in my childhood home often involved a dal, roti, amle ka achaar and sometimes Baingan ki Kachri. Some popular seasonal vegetables available in the bazars in the summers are ghiya (bottle gourd), tori (snake gourd), tinde (apple gourd) and the ever loved bhindi or Okra/lady fingers. 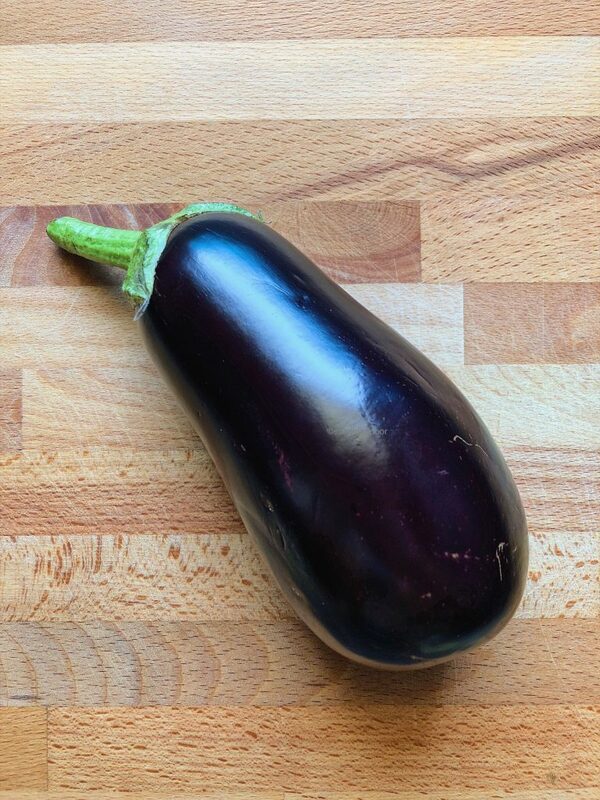 Like Karela or bitter gourd, baingan or eggplant is a fairly controversial vegetable in a number of homes. But I enjoy it in many forms. 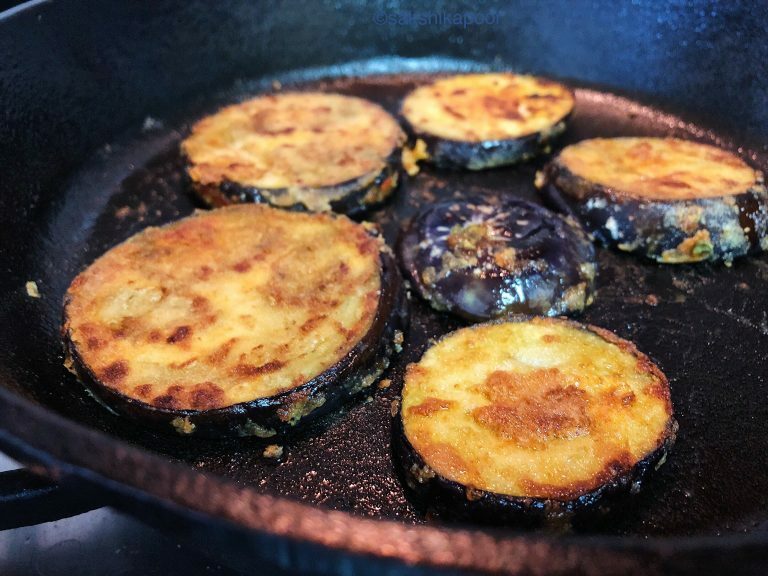 Whether it is a simple baingan aloo ki sabzi, baingan ka bharta or Khatte baingan, I polish off Baingan in all forms from my plate and sometimes straight from the kadhai! 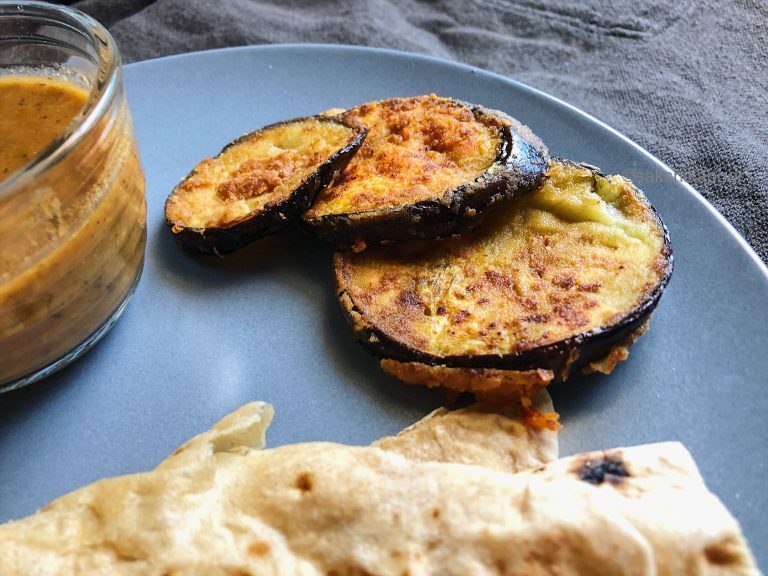 Kachri or Bhaja or Eggplant Parmesan? Now some may look at Baingan ki Kachri and say it’s like Bengali Begun Bhaja or even an Eggplant parmesan. 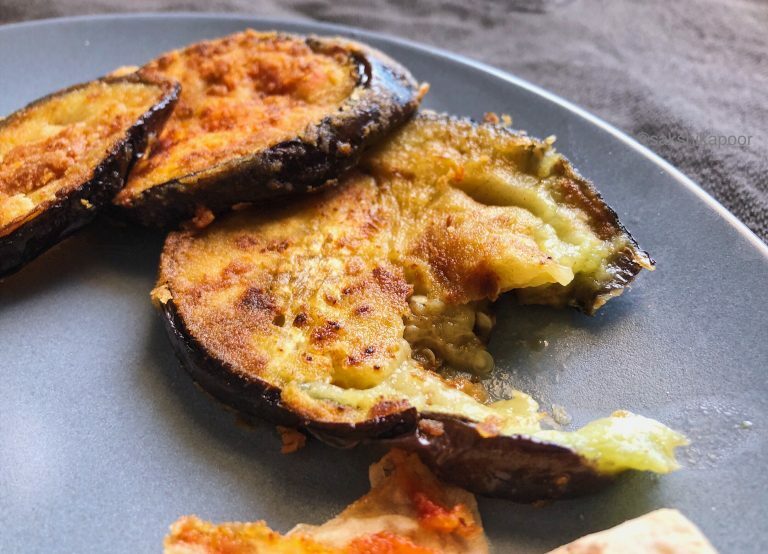 Well it is definitely similar to a Begun Bhaja but I had little knowledge of the Bengali favourite in the 1990s when I first ate it. My mother started cooking it when she recollected the recipe of the version she grew up eating. 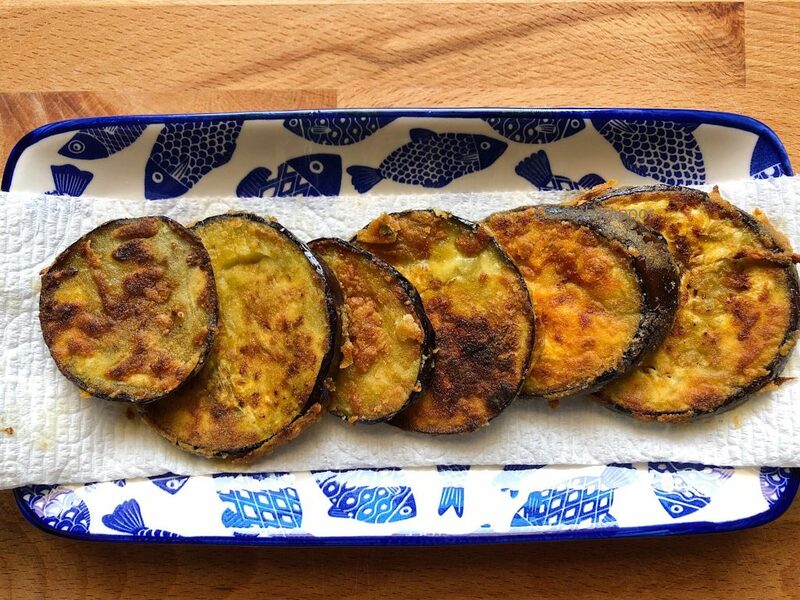 A Begun Bhaja dish uses besan or gramflour to coat the eggplant slices whereas the Baingan ki Kachri uses good old aata or whole wheat flour. I find Baingan ki Kachri to be an easy and quick side dish to prepare on weekdays and have actually started making them more often after I was reminded about this dish by my sister a few months ago. Start by washing and drying the eggplant. 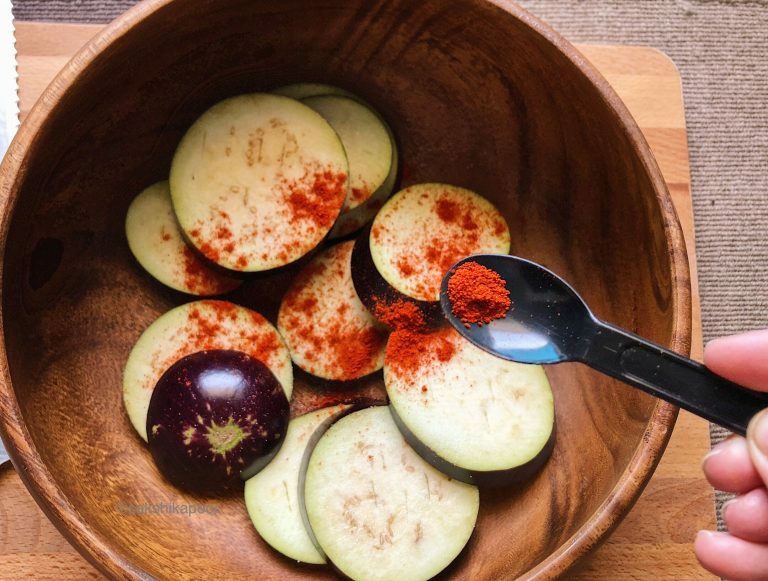 Slice the eggplant into disks and transfer to a bowl. 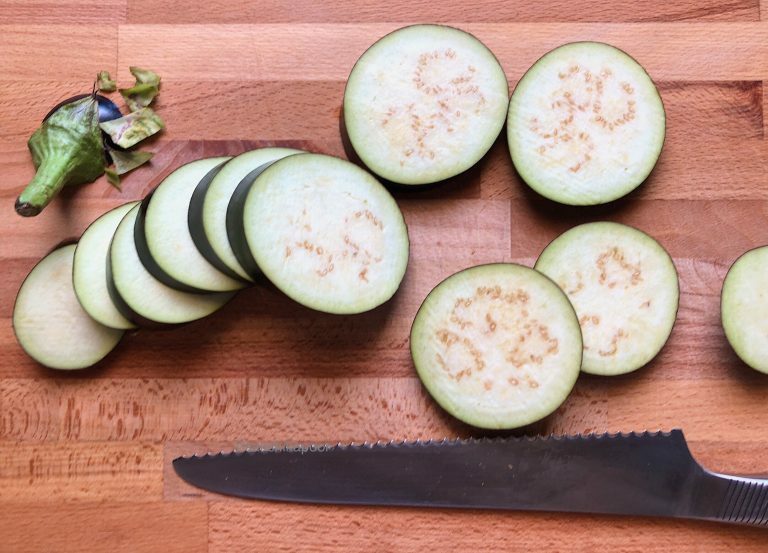 You may use the tip of the knife to scratch the face of slices on both sides. 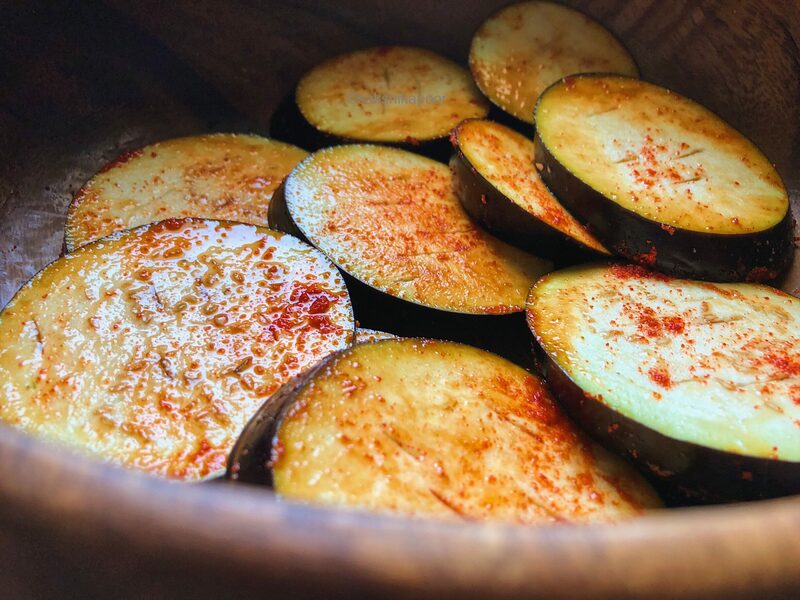 Sprinkle salt and red chilli powder on the eggplant slices and toss. Keep aside the slices for 10 minutes till you see them sweat. Next, place a griddle or cast iron pan on medium heat and grease it with some vegetable oil. Let the pan/griddle heat up. 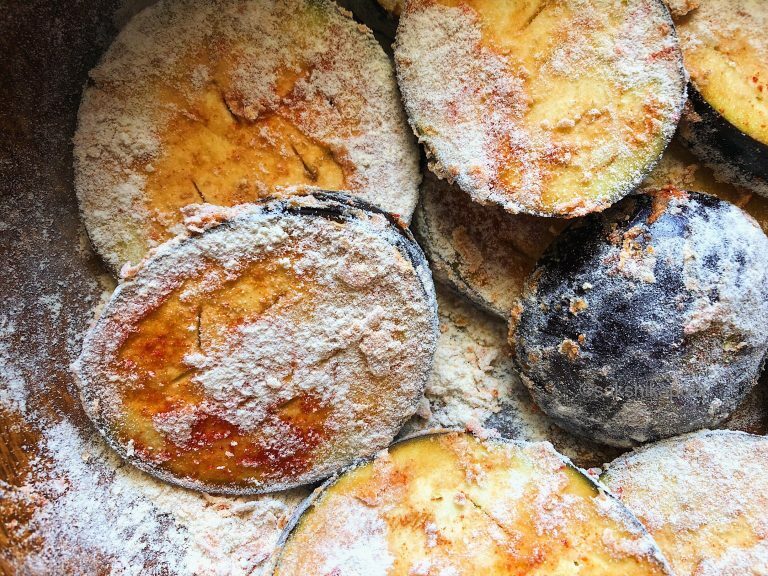 While the pan heats up, sprinkle whole wheat flour on the slices so that it is absorbed by the eggplant slices. Spread the slices on the hot pan/griddle and cook on both sides by turning them at intervals. The slices should become soft and form a thin crust on cooking. Baingan ki Kachri is ready! Take out cooked Baingan ki kachri slices out of the griddle/pan and serve hot on the side of rotis, dal or curry. Whole wheat crusted spiced eggplant slices or Baingan ki Kachri is a quick and easy side for rotis, dal or curry.